Top Massage Chair For Tall Person: Which Is Right For Me? You are here: Home / Massage / Massage Chairs / Top Massage Chair For Tall Person: Which Is Right For Me? Nowadays, the market is full of massage chairs to suit every taste and need. Unless you’re a tall person. If so, finding a massage chair that would be able to accommodate you and provide therapeutic benefits at the same time, can be a struggle. Most manufacturers simply ignore those outside the average. Which is why you might have trouble finding the massage chair that wouldn’t leave you uncomfortable and disappointed. What’s more, many massage chairs claim to be something that they’re not. 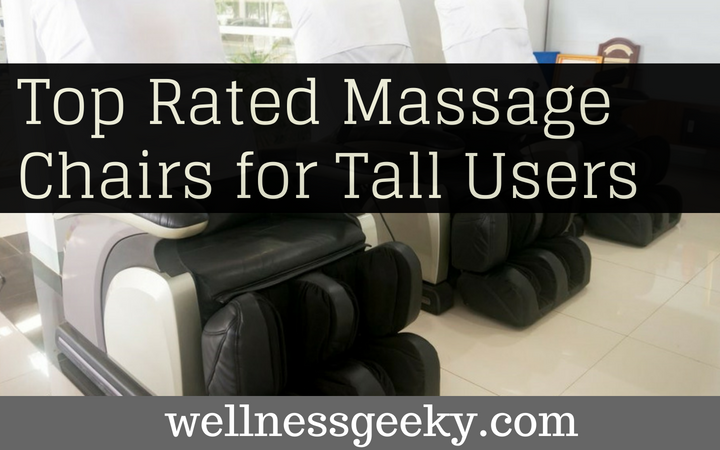 That’s why we gathered a list of top 5 massage chairs for tall people. After thorough research, you can find the chair that you can finally benefit from and enjoy the experience. Casual users or those who suffer from back pain, Infinity Iyashi massage chair is designed for both. This massage chair has a little bit for everyone, but it comes with a number of features that are therapeutic and highly adjustable. Infinity Iyashi comes from a company that also made Infinity Escape and Infinity IT8500. 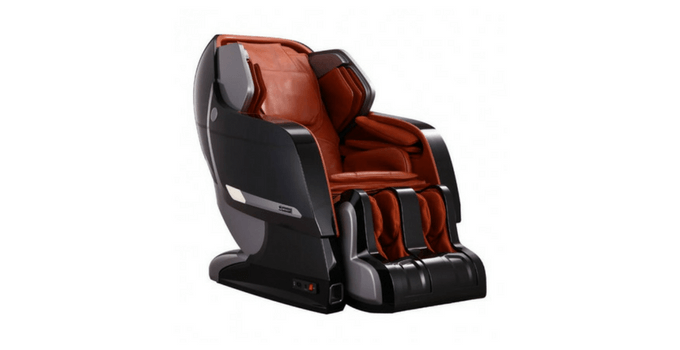 Iyashi massage chair has Hybrid L/S-track. It is one of the longest massage tracks on the market today. The two-level zero gravity positions provide deep tissue massage, and the full body stretch is beneficial for many. The foot and calf massage is customizable; the dual feet rollers can be regulated to three different speed levels. Low back heat therapy, air massage mode, and a number of massage options make this chair a strong competitor. There are a few downsides to this massage chair. The fact that it’s very heavy is just one of them. The temperature in the heat therapy cannot be controlled, which is quite common. The major drawback is poor customer support of the company, but this massage chair in itself is a valuable find. Infinity Iyashi massage chair seems like a whole package. It has a space-saving technology, zone massage mode, and it packs all the beneficial features. 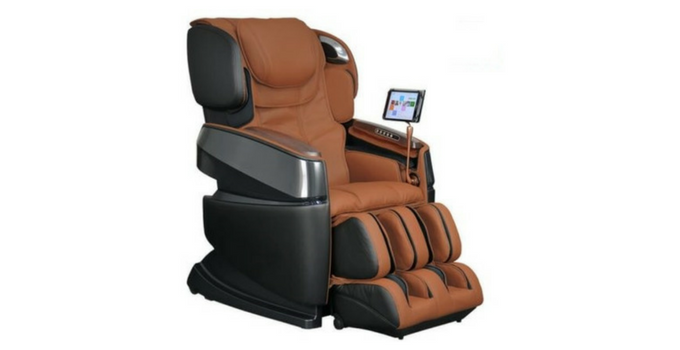 User-friendly and adjustable, Iyashi massage chair is highly functional. When it comes to Kahuna massage chair models, they are one of the top massage chairs. Praised for their features, Kahuna is able to accommodate tall users whether it’s Kahuna LM6800, or SM7300. Apart from that, they are FDA certified medical devices and provide therapeutic massage to its users. SM7300 comes with a hybrid S/Ltrack massage with a six-roller system, which is a significant upgrade from the standard quad rollers. It provides heat therapy in the lumbar area. This massage chair is one of those zero gravity recliners that offer a full body massage with positive benefits for those suffering from chronic back pain. 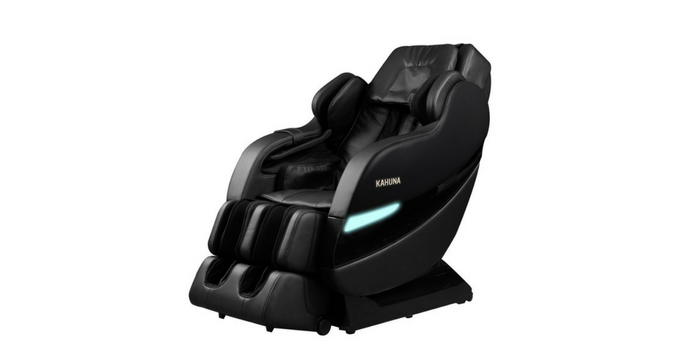 Apart from the rich features, Kahuna massage chair has five massage techniques available, along with another five pre-programmed massage options. What’s more, the users can regulate the intently level settings. For those who suffer from the specific sensitive sport on their back, Kahuna offers a Zone massage mode. Few off-brand massage chairs have zero drawbacks, and Kahuna SM7300 only has a few: the lumbar heat temperature cannot be controlled. Also, there is only one zero-gravity position. This massage chair is an amazing value for money, especially with its space-saving design and a wide array of massage options. With an additional yoga stretch function, it definitely makes this a premium massage chair. It is great for someone over 6′ Tall & 300 lbs. If you’re looking for a premium massage chair, this Ogawa Smart 3D may be the one for you if you are big and tall. A Chinese massage chair for tall people, this model is top of the line chair with extensive features and one of the best imitations of human touch chairs on the market. 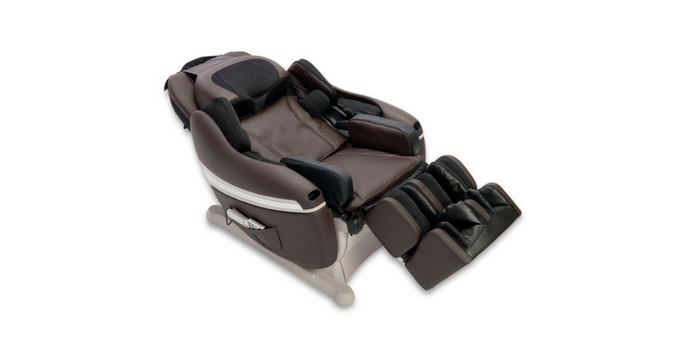 Ogawa massage chair has an L-track with quad rollers that provide a unique massage experience. It mimics human hands and comes with many massage options. You can pick from six massage techniques, many pre-programmed massage options, and Thai body stretching function. One of the more expensive models, some may find it disappointing that Ogawa 3D lacks the foot rollers. Also, the temperature cannot be regulated. In any case, this massage chair is an incredible value for money. It’s amazing, therapeutic, and the full body stretching function is a very welcome addition. This is a great massage chair for both casual users and those who are looking for something more therapeutic. Another bonus is the warranty; this massage chair comes with a 5-year warranty. 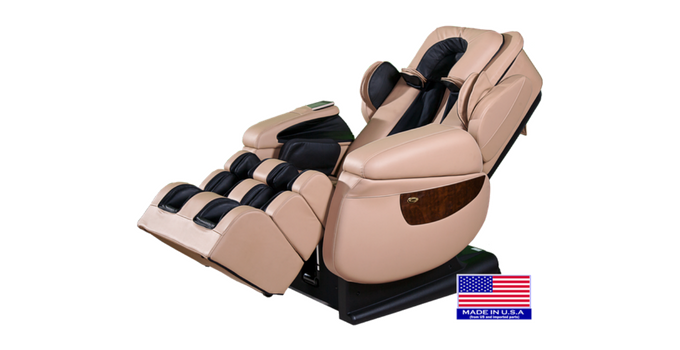 Made in the USA, Luraco massage chair models are a huge hit on the market. While this model is already in a higher price range, it fails to disappoint. Loaded with therapeutic features, the Luraco iRobotics provides its users with real relax and a number of benefits. iRobotics massage chair comes with a 4D massage, namely 4D roller technology. While it only provides its users with one zero gravity position, it comes with an extensive number of massage options. With a number of airbags, the Luraco model is able to give a thorough massage. The heat therapy can be regulated to 5 intensity levels in the lumbar, seat, and feet area. What’s more, the full body stretch and the full body scan technology are only additional bonuses that contribute to the overall massage quality. Extensive in its features, the Luraco model lacks one important one: there is no space-saving technology which may be a downside for those where space is an issue. On the other hand, this massage chair comes with a memory function which enables you to save your favorite settings and choose them with ease. If you’re looking for the best massage experience, in a massage chair for tall people, this may be the one for you. One of the few massage chairs made in Japan, Inada Dreamwave is an upgrade of an older Inada Sogno Dreamwave model. The new Inada has been redesigned and improved with beneficial features. Inada massage chair comes with an S-track design, 3D full-body scanning, and a wide variety of massage options that please many. Apart from the six massage techniques, eight pre-programmed massage options, the users can adjust the speed, rollers, and intensity levels in many of these programs. With 101 airbags, Dreamwave massage chair enables you to customize even those. With a thorough calf and foot massage, it truly provides a soothing experience. The major Inada Dreamwave drawback may be its price tag. The fact it lacks L-track design in his price range is disappointing. Also, this chair is quite heavy, but that’s quite common with many of the models on this list. Overall, this massage chair is an amazing combo of features, strong massage technology, and techniques that can please even more demanding users. When reviewing massage chairs on the market, it’s sometimes difficult to decide whether the chair is your potential choice. Still wondering which is the best massage chair to accommodate a tall person? After a careful check of the massage chairs on the market, Kahuna EM3700 massage chair is our top choice. The decision was not an easy one and Luraco iRobotics is the second best. If you’re looking for a more therapeutic massage chair, Luraco is the best option. On the other hand, Kahuna is an FDA registered medical device. I will provide you with more or less same features but at a different price tag. If you’re on a budget, Kahuna is your best choice.